We all went to the Last Shift Banner picnic on Saturday afternoon. It was great to see the school banner on display with its bigger brothers and sisters from local collieries! The picnic was in full swing when we got there, with brass band, folk singing, rapper dancing and shuggy boats. A wonderful way to finish off the festival. So now its time to get on and develop new work for Autumn shows and exhibitions. I’m really taken with the idea of doing some pieces based on hedgerow flowers. Has anyone else noticed how beautiful, and prolific, the wildflowers are this year? It would be lovely to capture them in stitch and cloth. I’ve been sketching and photographing for a while so I think its time to start experimenting now. Perhaps with soluble fabric as I think the spaces and layers between the plants are important. These lovely flowers are on the bike route into town, a great border between the bike and foot paths! I’ve had some time out to see the textiles art that local branches of the Embroiderers’ Guild have displayed to celebrate Capability Brown’s 300th birthday. The teatowel display at Gibside looked gorgeous, blowing in the breeze in the walled garden. There are more pieces on display in the chapel, and another collection at Wallington too. Well done to all my friends taking part in this – we had fun spotting all your work! 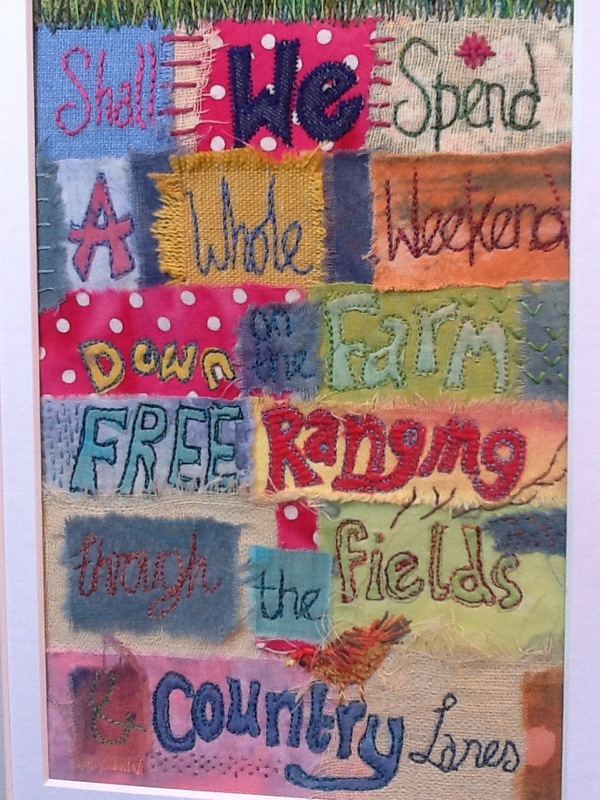 This entry was posted in art exhibition, community project, craft workshops, embroidery, Pit Village Colliery, seasonal, Uncategorized and tagged applique, British Summer, countryside, embroidery, Exhibition, Festival, machine embroidery, stitch, textile art on July 25, 2016 by donnacheshiretextiles. These are preparation for ‘Along the Way’ a piece inspired by journeys through Scotland. I love the way houses and farmsteads hunker down amidst the hills. 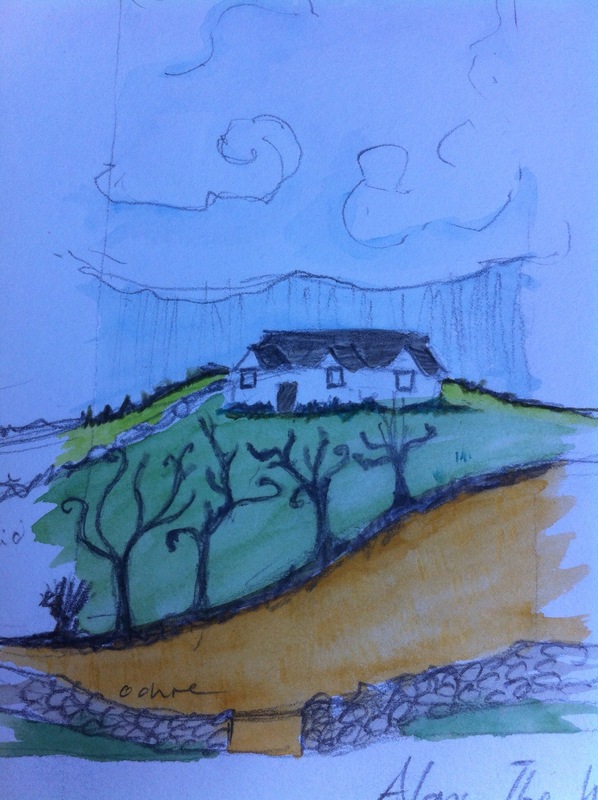 Often the trees look blasted and twisted by the wind and rain, forming shapes that stand out against the skyline as if they are stitching the clouds to the hills. Here it’s nearly complete but needs those trees to be added in. 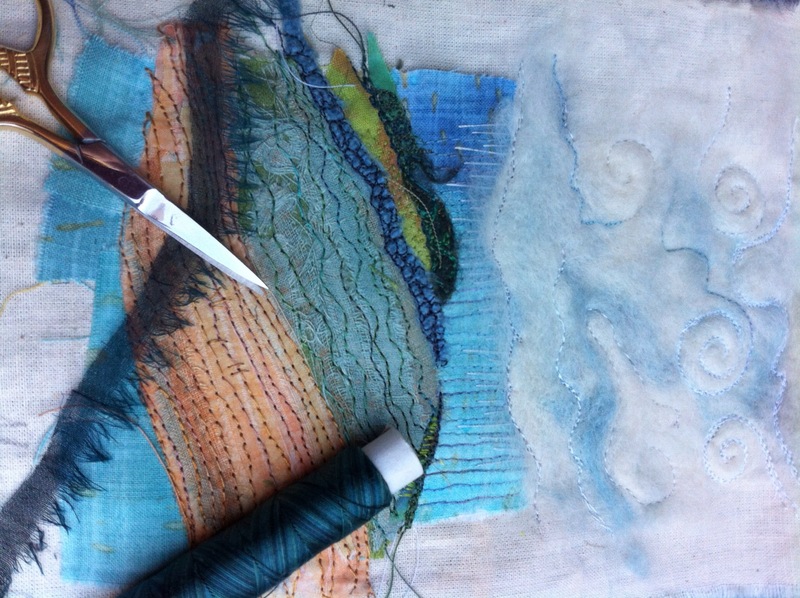 I’ve added texture with machine and hand stitching using wonderful Oliver Twist threads. 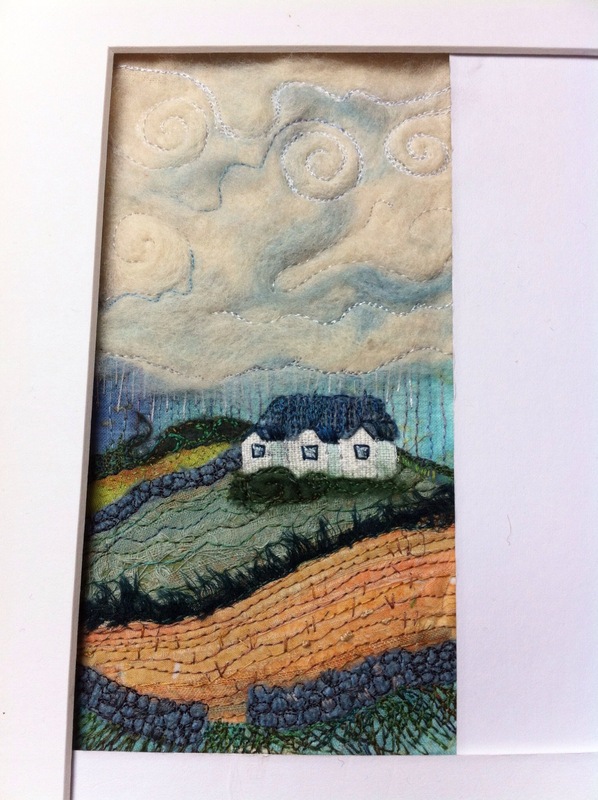 The dry stone wall combines stitch with needle felted wool blanket fabric. 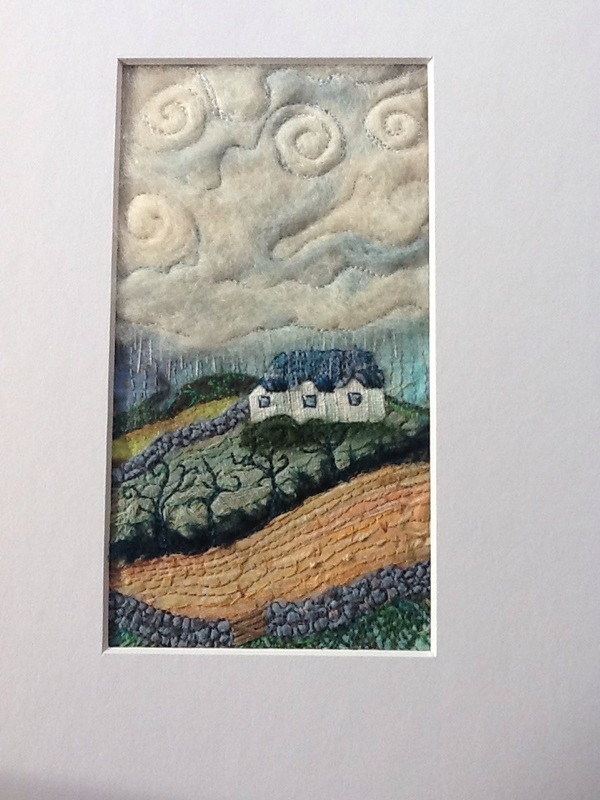 This entry was posted in artwork and tagged countryside, embroidery, needle felting, rural scene, Scotland, stitch, textile art on October 13, 2014 by donnacheshiretextiles. A new piece in the Day Trippers series-might have to be renamed the weekenders! 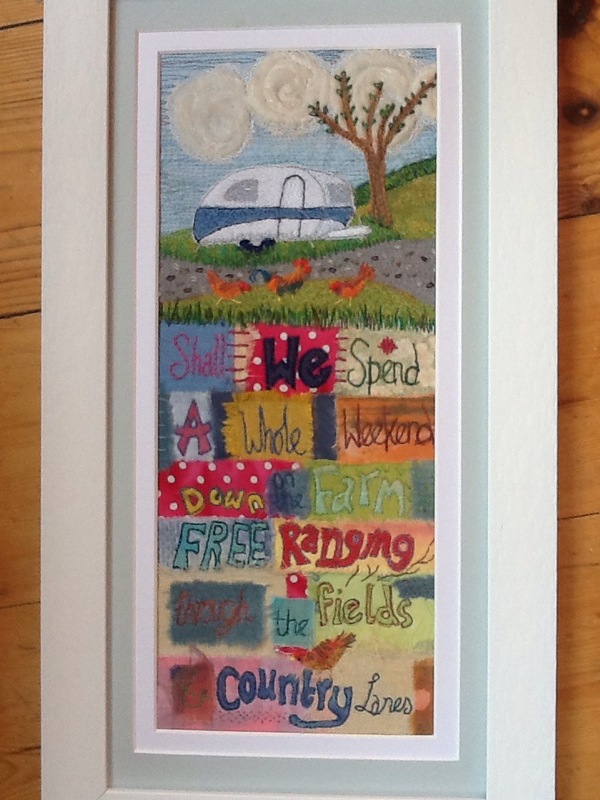 Inspired by our little camping trip earlier this year when we stayed in a vintage caravan, the only cooking spot was a campfire, the view was fields as far as the eye could see, our neighbours were feathered or four legged and it was wonderful! So, if you feel the need to slow down, take a cuppa, put your feet up and enjoy this view! 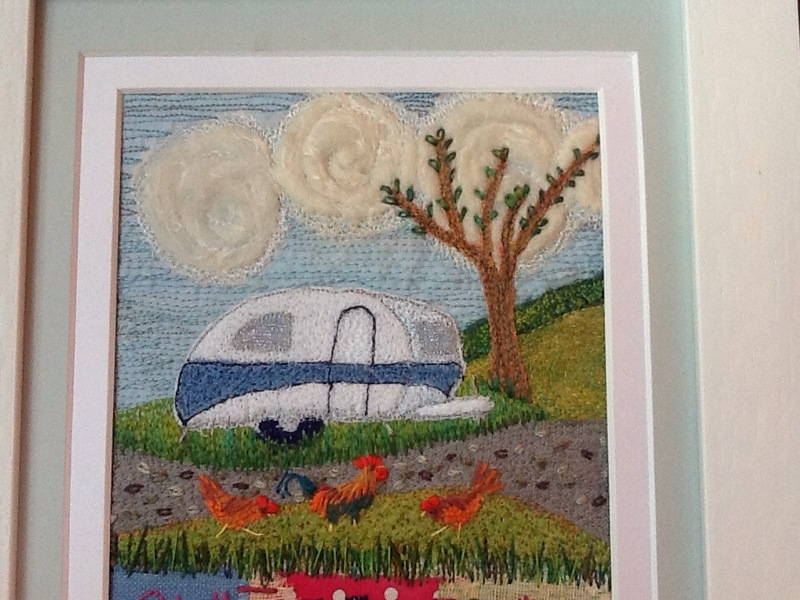 This entry was posted in artwork and tagged applique, caravan, countryside, farm, holiday, stitch, vintage on October 5, 2014 by donnacheshiretextiles.